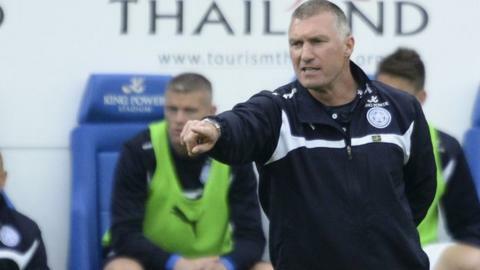 Leicester City manager Nigel Pearson doesn't know how his side have produced an "unthinkable" run of good form. Bottom of the league from November to early April, the Foxes secured a sixth win out of seven, beating Southampton on Saturday to move to 15th. "I don't know why it's changed for us," said Pearson, whose side have a three-point cushion on the bottom three. "We've played well for a long time but now we're keeping clean sheets and scoring more." "Our managing of the game during matches has improved. That has come with the experience of playing in the Premier League. We didn't have that at the beginning of the season. "When you look at the run we're on currently, which is pretty unthinkable really in the context of our season, it needed to change, looking at the results of the other teams who are down there with us." Pearson was named Manager of the Month for April earlier this week and his side continued the form which won him the award as Riyad Mahrez struck twice in the opening 20 minutes to beat Ronald Koeman's side. They now have four clean sheets in five games - more than they earned in their 19 previous league fixtures - and 17 goals in eight outings ahead of their final two matches against Sunderland away and at home against Queens Park Rangers. "If two months ago you'd have said it would be in our own hands going into the last game of the season, I'd have taken it," added Pearson.